Tibetan writer Shokjang in an undated photo. 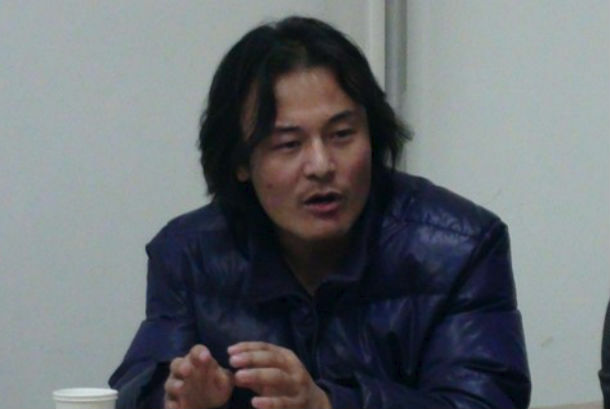 (TibetanReview.net, Apr10, 2015) – Chinese authorities have again detained a prominent Tibetan writer in Rebgong (Chinese: Tongren) County of Malho (Huangnan) Prefecture, Qinghai Province, for what is believed to be his writings critical of the tight security restrictions in the county. Druklo, whose penname is Shokjang, was secretly detained on Mar 19. His friend and writer Tashi Rabten (penname Theurang) was also taken away around the same time. Shokjang continued to remain detained while his friend was released later on, reported Radio Free Asia (Washington) Apr 8. The reason for his detention remains unknown, although he is believed to be held at a detention facility in Rebkong. The fiercely outspoken writer was said to have blogged about the massive deployment of Chinese security forces in Rebgong, with soldiers holding weapons in a state of readiness to fire, ahead of the Tibetan uprising anniversaries of Mar 10 and 14. He was also said to have written on the poverty of the Tibetan students in Kangtsa (Gangca) County in Tsojang (Haibei) Prefecture, also in Qinghai Province. Both Shokjang and Theurang were previously detained on Apr 6, 2010, accused of having led a student protest and contacted outside writers and the Tibetan Youth Congress in exile. The former was held in Lanzhou, capital of Gansu Province, while Shokjang was taken to Chengdu, capital Sichuan Province. Shokjang, who originally belongs to Gengya Town in Sangchu County, Gansu province, was released on May 8, 2010, but placed under a 10-year watch. He was also banned from returning to the North West University of Nationalities in Lanzhou and disallowed from taking his final exams there.